On various occasions I have looked at FIS point race penalties, in a very general, roundabout way. Most recently, I looked at whether the FIS points you get in a non-World Cup race accurately reflect what you would have scored if you had raced in a World Cup race. The answer appeared to be: kind of. At least for the OPA Cup and Scandinavian Cup circuits. Specifically, we do see roughly the sort of relationship we’d hope to, though there is considerable variation from skier to skier. This is an important example of the difference between something being true on average, and being true absolutely in every case. One interesting extension of that post is to look at top North American races and see if we find a similar relationship. The methodology is exactly the same, only the races I’ve used have changed. I looked for skiers who did at least one “minor” race (Super Tour, Nor-Am, US/CAN Nationals, Continental Cups) and at least one “major” race (World Cup, Olympics, World Championships) in a single season. This leaves us with an even smaller collection of athlete/season data points than before: generally only 5-15 skiers per season. We also have the same problem of small numbers of races. A skier may have done a bunch of domestic racing and then only one World Cup in a season. So all the same caveats apply. As you can see, there are many fewer data points here. However, the end result is basically the same. 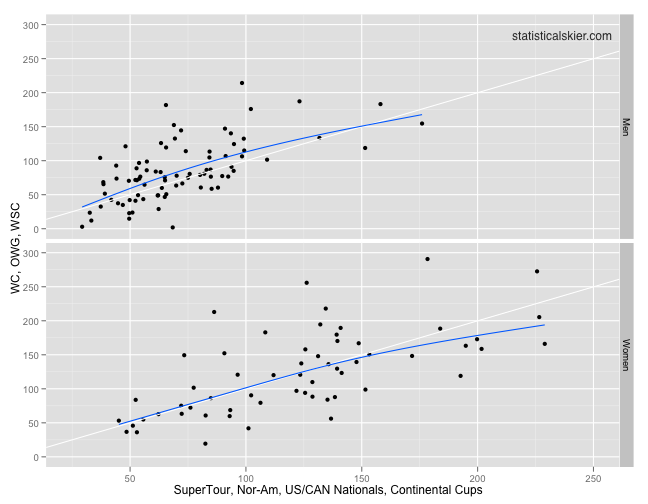 The overall correlation between median FIS points has, if anything, improved over the OPA/SC cup case. However, the high degree of variability has remained as well. Posted by Joran on Friday, August 26, 2011, at 6:00 am. Filed under Analysis, Cross Country. Tagged fis points, penalty, prediction, World Cup. Follow any responses to this post with its comments RSS feed. You can post a comment or trackback from your blog.